The only country I had visited in the Far East was Japan, in 2007, and I felt that it was time for another trip to that part of the world. Despite recent adjustments in the exchange rate Japan was still likely to be very expensive, and one of the most attractive alternatives was South Korea. I knew a few people who had been there on business but no one who had been for pleasure, and it did not feature high in the list of popular holiday destinations. 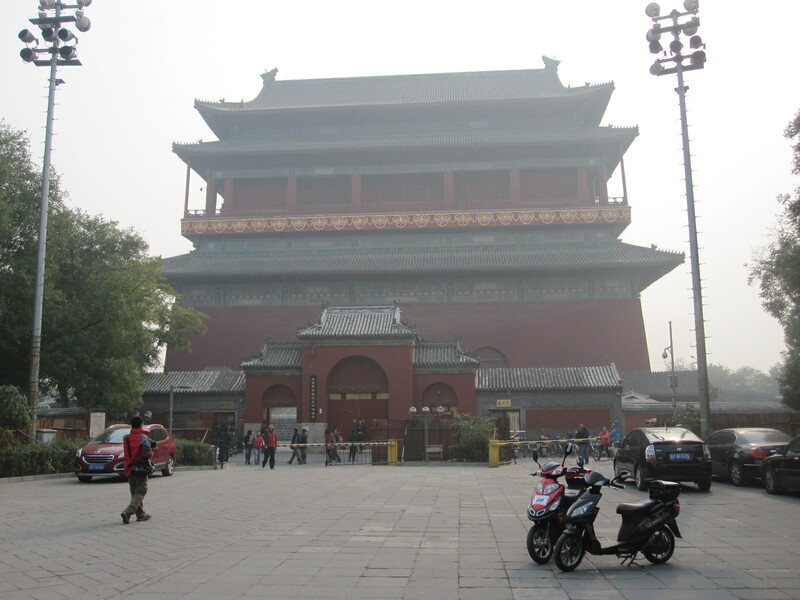 The most favourable route on cost and convenience was from Gatwick via Beijing with Air China, and this was further supported when I discovered that I could get a 72-hour visa-free stopover in Beijing at no extra flight cost. This visa-free arrangement had been recently introduced and even some travel agents did not know about it. It made best sense to make the stopover on the return flight, otherwise I would be jet-lagged for much of the time in Beijing. The outward flight went smoothly, and I arrived at Seoul Incheon Airport at about mid-day of the day after I left England. As I knew I would be fairly exhausted I had booked a hotel near the airport, and was picked-up by a minibus driven by Smokie Shin, the hotel manager. He was not actually christened Smokie, but acquired the name as a result of his liking for a pop group of that name when he was a student. By the time we reached the hotel, a distance of about two miles, I had decided that everything in Korea was made between them by four companies, namely Samsung, LG, Hyundai/Kia, and Daewoo. After a few hours sleep I ventured out of the hotel, which was in a modern business area with shops, restaurants and a supermarket close by. The hotel did not have a restaurant and to tide me over until I decided where to eat I tried to get a cup of coffee from a machine in the supermarket. Everything was in Korean, and while I was puzzling over which buttons to press a voice behind me said “Can you help me?” I thought it was highly unlikely, and turned round to see a man with a little girl. He repeated “Can you help me?” and then said “No, no, I mean can I help you?” He showed me how to get the coffee, and this was the first of many offers of help that I was to receive, but also a typical example of the level of communication that I was to experience in Korea. Eventually I found a cheap restaurant with pictures outside of rice dishes that looked tolerably appetising. No one spoke English but I got what I wanted by pointing at the pictures and the waiter had the sense to offer me a spoon and fork as well as the dreaded chopsticks. The next morning all the restaurants were closed, and I finished up getting something from the MinMart and having breakfast in my room. By now I had been reminded of another custom that seems to be standard in the Far East, that of removing one’s shoes on entering most rooms and many restaurants to preserve the polished wooden floors. This was a bit of a problem for me, because some of my socks have holes in them, so I had to sort through them to find some intact pairs. At 8.00am I got the free hotel shuttle to the airport and from there a bus into Seoul, which is about 20 miles away. It was Sunday and the journey did not take long, but when we arrived at the City Hall it turned out that it was the day of the Seoul equivalent of the London Marathon, and the place was a complete madhouse. Many of the runners were finishing already, and although some of them looked as if they could run a full marathon others looked as if they would be hard put to to manage 500 yards, and I could only assume that there were classes for various different distances. 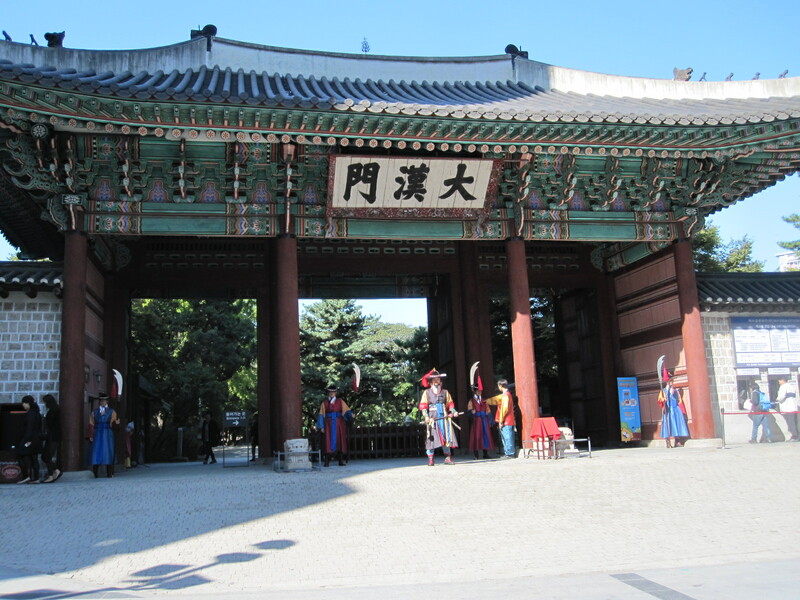 Close to City Hall is Deoksugung Palace, one of five in the city. It consists of a number of ancient and beautiful buildings, apparently all empty, with two more recent neoclassical ones that are used. 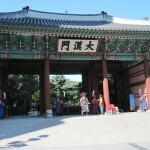 As I left a ceremony was taking place in front of the main gate with people in traditional costume. This central area of Seoul is very much a business district and could have been anywhere in the developed world. It was only later that I realised that Seoul is actually the third largest metropolitan area in the world, with almost three times the population of Greater London, and larger than Beijing, Mumbai and Mexico City. From here I walked down to Myeong Dong, a popular shopping district which was thronging with people, and then along a road called Toegyero to Chungmuro and the motorcycle shops, some of which were closed because it was Sunday. A length of the street before the motorcycle shops was lined with pet shops, with dogs and cats in the windows in a manner that is seldom seen in Britain today, and which I found unpleasant, although there was no real sign of maltreatment. The much-condemned Korean custom of eating dogs has almost died out, and many Koreans are strongly opposed to it. It still happens on a small scale, the meat coming from dogs that are bred for the purpose. The streets in the area behind the motorcycle shops were shabby and lined with workshops and small businesses, most of which were closed. There was a slight third world atmosphere about the place and I resolved to come back later in the week when there would be more going on. From Chungmuro I went by subway to Namdaemun Market, one of the two big markets in Seoul. As someone with a mortal fear of public transport in foreign countries I actually found the subway quite easy to use, especially considering its vast size and complexity. It is the world’s most extensive subway by length, with 607 stations (the London Underground has 270) and very modern trains and systems. The market proved to be disappointing, with little to interest me, so after another walk around the city centre I got the subway to Hongik University. 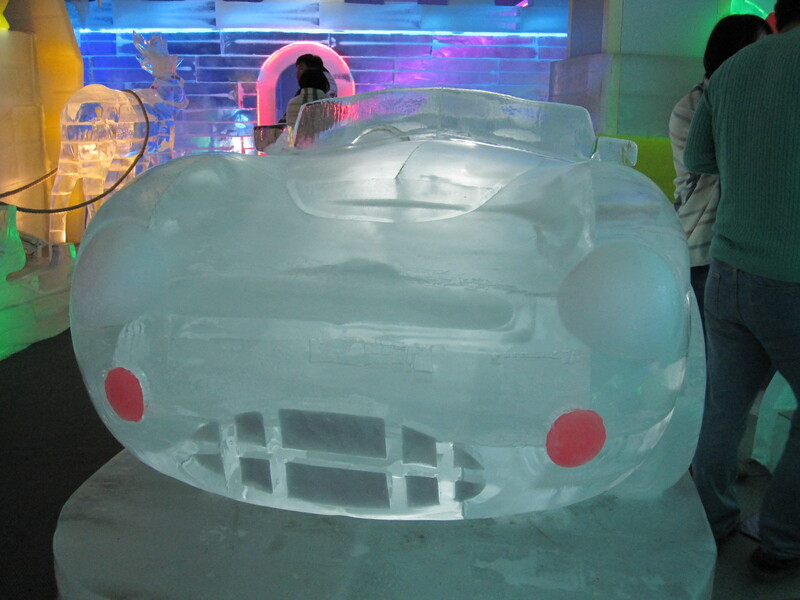 It was not the university that I was aiming for, but an art gallery called TrickEye and its associated Ice Museum. TrickEye was supposed to be an exhibition of Tromp d’Oeil, which have always fascinated me, but in the event the pictures turned out to be rather poorly executed, contrived as a means of family entertainment rather than any sort of art. 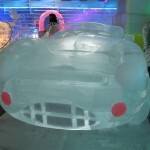 The Ice Museum had ice sculptures ranging from a full-sized car to the interior of a house, with bathroom including toilet. Too cold to stay there for long. The Express train back to the airport stopped at Hongik University, and on the platform were two cheerful young students of about 19 who started chatting to me. They said they were from Taiwan and assured me that the next train went to the airport, although I thought the indicator said it only went half way. We all got on, and in due course it turned out that I was right. When we boarded the next train, which was the correct one, they sat with me and started talking again. They informed me that they were ear, nose and throat specialists who had been attending a conference in Seoul. A good example of how difficult it is for westerners to judge the age of oriental people. The next morning I checked out of the hotel and collected my car from Avis at the airport terminal. I had ordered a Ford Focus-sized car, but the one that was put in front of me at the roadside was a silver Hyundai Sonata, like a big Mercedes. After a brief car condition check the man from Avis fixed the large and expensive satnav to the windscreen and explained how to use it. It was programmed in English and was immensely complicated, like all modern gadgets. With some difficulty we put into it the name of the town I was going to, Chuncheon, and I launched out into the mad Seoul traffic. From the rather basic map that I had it seemed to me that the most direct way to Chuncheon was via the motorway (Expressway) skirting Seoul on the northern side, but after a while I realised that the satnav was taking me round to the south of the city. By the time I had gone through three toll booths with my wallet being emptied at a great rate I was convinced that I was going the wrong way, and turned off into a town called Gunpo. The intention was to buy a proper map and find out where I was, but Gunpo was not a good place for doing that. From a quick check on the shops and a supermarket in the main street I concluded that maps were unobtainable and no one spoke English. Back in the car I tried to get a solution from the satnav but only succeeded in messing it up completely. In desperation I drove on for a while and found some signs with road numbers, but they did not tie up with anything on my small-scale map so I pulled into a service station to see if I could find someone who could reset the satnav. Luckily there was a man there who spoke little English but did understand the satnav, and he managed to put Chuncheon into it again. Full of hope, I set off following the instructions from the American lady whose voice came out of the 8 inch screen on the dashboard. Unfortunately she did not confine her advice to giving directions, but churned out a constant string of mostly irrelevant comments. These included “Speed bumps”, “School zone”, “In 700m the speed limit is 80kph”, “Parking infringement penalty area”, and my favourite “Approaching traffic volume monitoring area”. If there was nothing else she would say “Drive carefully”. This extra information could no doubt have been switched off, but I could not see how. 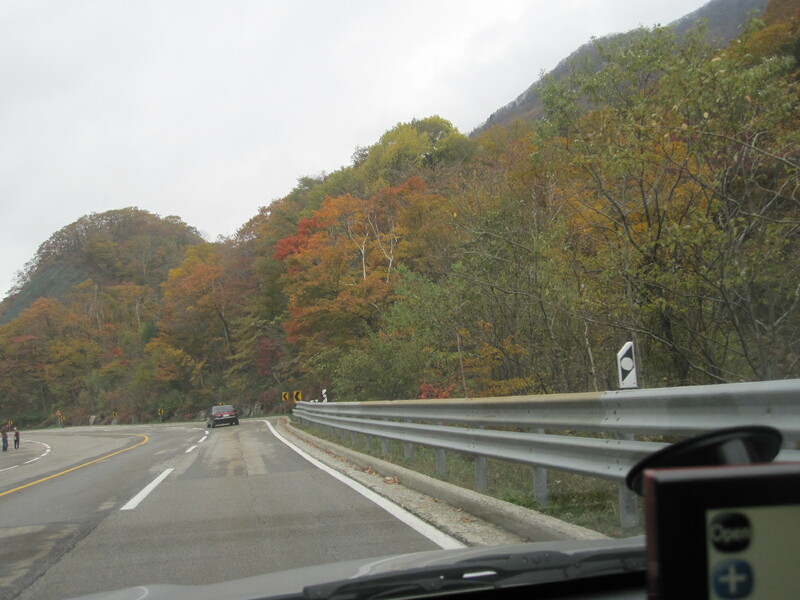 She took me back to the Expressway and after a long time, distance, and more tolls I was ordered to turn off on to route 46 towards Chuncheon. This was an ordinary main road running through open countryside but lined with buildings for mile after mile. By now I needed something to eat, and stopped at a place with several roadside food stalls which had big pots bubbling away full of strange unidentifiable substances. However, tucked behind some trees was a traditional coffee house with a complex of ancient buildings. Someone directed me into one of them, which involved the shoe taking off procedure, and when I saw the set up and menu I realised that this coffee and cake was not going to come cheap. Despite that the place was quite busy, but the most worrying thing was the low tables, which are all right for the locals who have been brought up with them, but a nightmare for elderly westerners. The table tops are about 18in above the floor, so you have to kneel, sit cross-legged or stretch your legs out straight. A cushion is provided on the floor, but the real problem is that there is no back rest, and however you sit it becomes agony after a few minutes. Luckily I was placed at a table at the side of the room, where I could wedge myself against the wall with my legs straight out. As expected, the coffee and cheesecake were good, but the price undoubtedly included a substantial component for the ambiance. Some distance before Chuncheon the road became route 45, still built up and slow going, with a lot of traffic lights. The approach to the town was scruffy and the first hotel I came across, called Hotel Petite, had screens across the car park entrance, usually an indication that it catered for clients who wished to be discrete about their presence. The next two were similar and rather run down, and another sign pointed to Hotel Zipper, which did not sound over-promising, though I am sure it would have been to some people. The satnav took me to the City Hall, where I thought there might be some tourist information, but it was closed for the day, and dusk was rapidly drawing in. Nearby was one the many small manned police stations that are commonly found on street corners in that part of the world.. 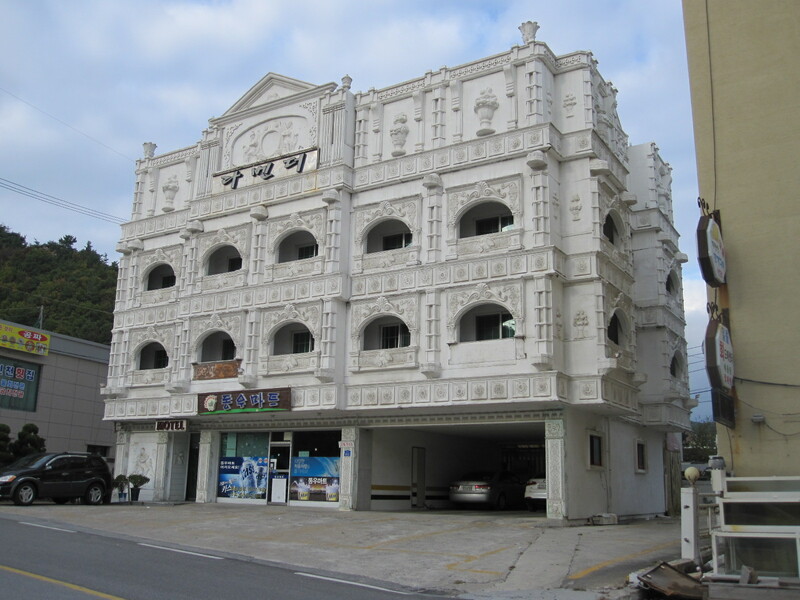 I went in and told the two officers that I was looking for a hotel in Chuncheon, Their English was practically non-existent and after about five minutes of getting nowhere one of them picked up the phone and held a short conversation with someone in Korean. He then passed the phone to me, and on the other end was a lady who spoke quite good English. She said they told her I wanted a hotel in Chungchang, which was a very long way away. This was a disappointment to me, because I thought I pronounced Chuncheon really well, but apparently that was not the case. Anyway, she explained to the officers what I wanted and they told her they would take me to a hotel nearby. A few minutes later I followed them to the excellent Sejong Hotel with their blue lights flashing, though no siren. Once sorted I walked down into the town and was amazed at the size of the shopping centre and adjoining market. It was all quite smart and tidy, and it seems that I had approached the town from an unfavourable direction. 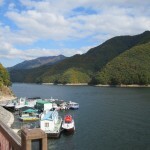 One of the few attractions in the Chuncheon area is the Soyang Dam, which I managed to find the next morning with the all-Korean map that I had picked up in the hotel. 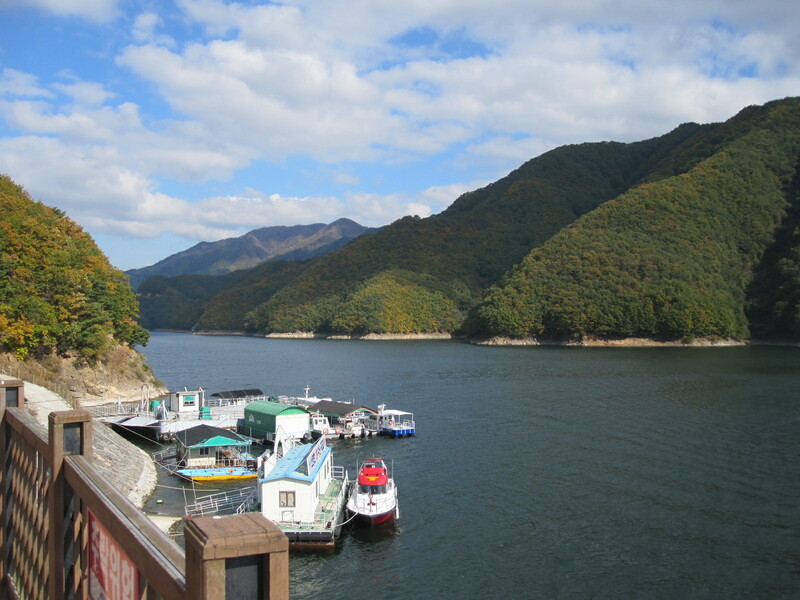 The associated reservoir made by any standards a beautiful scene, enhanced by the backdrop of tree-covered hills in autumn colours. At last I had broken away from the fast and furious traffic of the Seoul area on to relatively quiet rural roads passing through good countryside, though still with ribbon building at times. Around a place called Inje the road went through tunnel after tunnel, some of them one or two miles long, before a long, fast stretch to Sokcho, a coastal resort. As I approached the coast there was noticeable military activity in the form of low-flying jets. 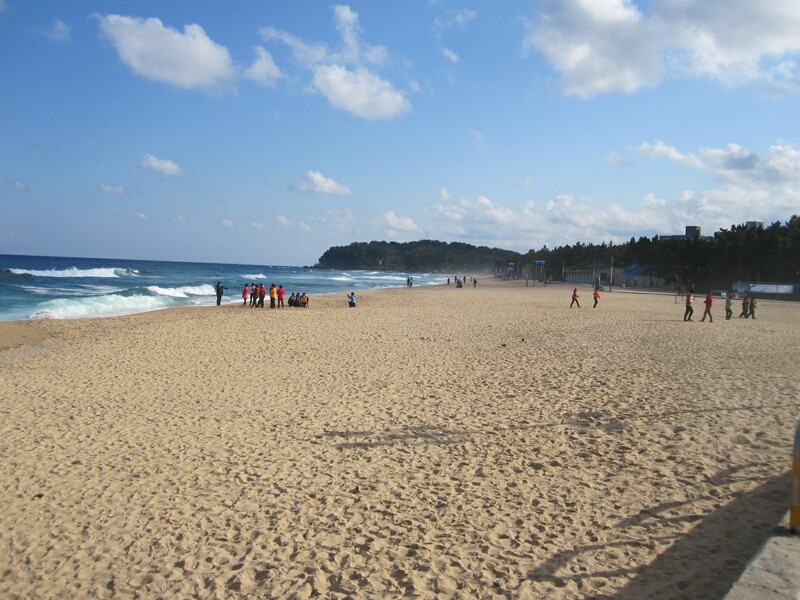 Although it is known to us as the Sea of Japan, the Koreans call the ocean here the East Sea, as they are unwilling to acknowledge any claim that the Japanese might have to it. 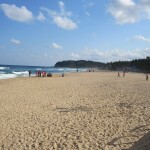 Sokcho seemed to be a pleasant small town, with a wide sandy beach and typical out-of-season seaside resort atmosphere. From there I drove down the coast, stopping to look at a couple of other places on the way to Jeongdongjin, where I planned to stay for the night, A few miles before Jeongdongjin is a length of coast known as Unification Park, which was the site of an attempted landing by a North Korean submarine in 1996. 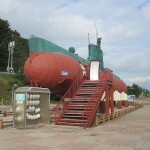 The shore line here is protected with fences and watchtowers manned by soldiers, with the actual submarine set up on dry land as a visitor attraction. 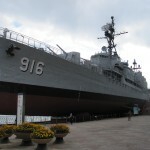 On the same site is a former American warship that served in the Korean War and later the South Korean navy before being hauled out on to the same said dry land and opened to the public. I resolved to look at these the following day. A really extraordinary place, a contender for the title of Tackiest Seaside Resort in the World. 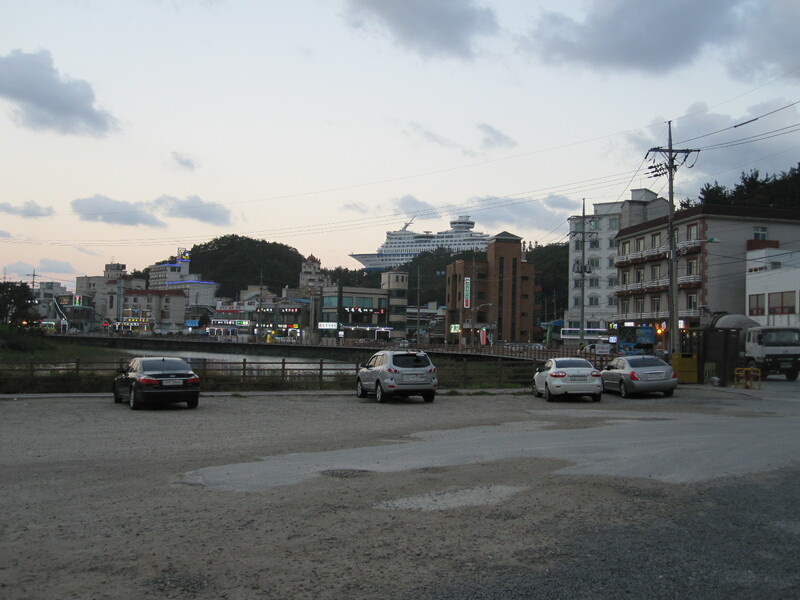 On entering the town from the north the scene is dominated by what appears to be a full-sized cruise liner precariously balanced high on a cliff top, as if deposited there by a giant tsunami. In fact, it has never been any closer to the water than it is now, and was purpose built on site as a hotel and conference centre called the Sun Cruise Resort. On a promontory below at beach level is another odd construction in the form of a schooner, which is apparently a restaurant, and most of the hotels in the town are characterized by wedding cake architecture straight out of a Disney production. My guide book suggested that it might be possible to stay at the Sun Cruise Resort, but it did not cater for individual travellers, and I had to try my luck with the other weird places. It took me a while to find one that was open, and when I booked in I was given a bag containing a toothbrush, toothpaste and a razor. 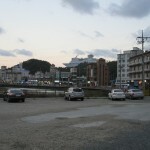 It appeared that the number of restaurants in Jeongdongjin exceeded the number of visitors currently in the town, and most of them had tanks in front of the windows containing large plump fish from which one was presumably expected to select one’s dinner. Like most meat or fish-eating Britons I am a coward and prefer to be less involved in the demise of the creatures that I eat, so I sought and found a place where the food was more discretely prepared, albeit not so fresh. 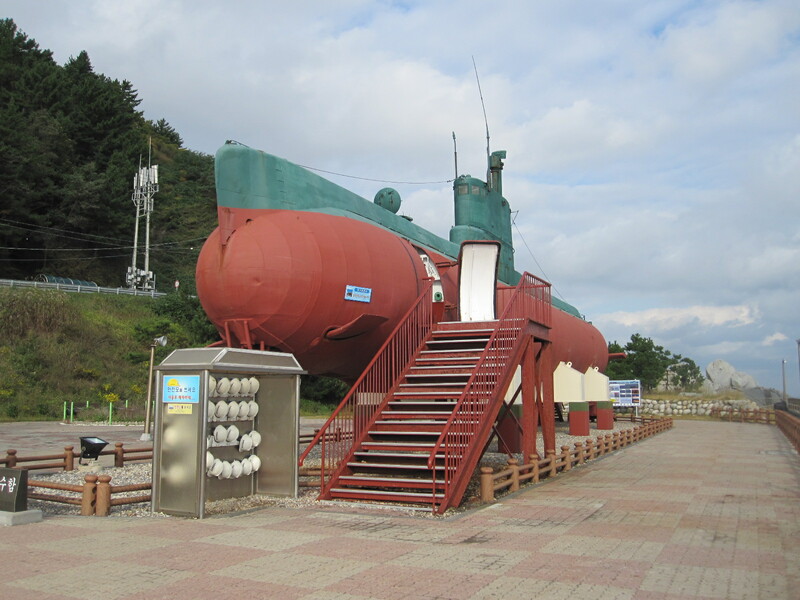 The next morning I drove up to Unification Park and was the first visitor of the day to the submarine and warship, which was ideal because submarines cannot accommodate many people at one time. The story of the submarine is pretty grim. It arrived with 26 North Korean spies, three of whom carried out a surveillance mission on a nearby airbase. When they returned to the vessel it got caught on the rocks and had to be abandoned. 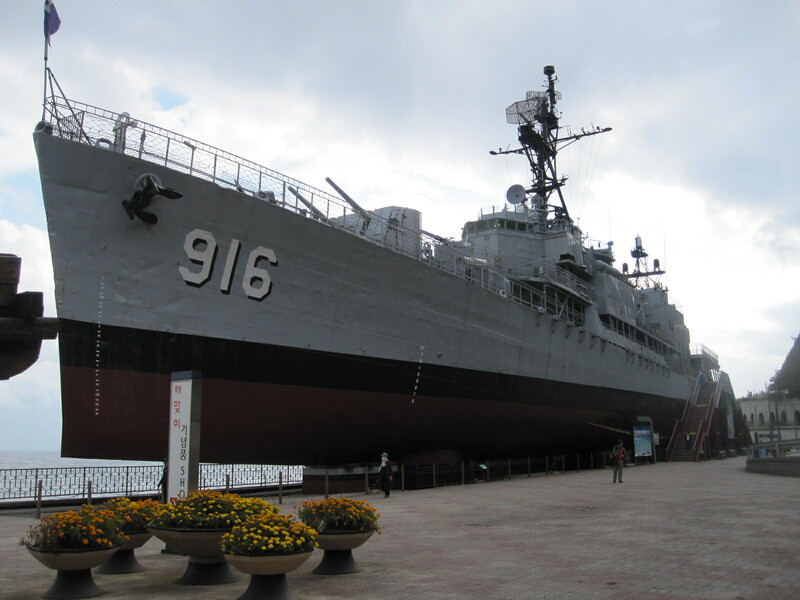 To protect classified information eleven non-military crew members were killed by the others, who then attempted to reach North Korea overland. Thirteen were killed by South Korean forces, one was captured and one was unaccounted for. In the words of the South Koreans on the information board “The incident was a great shock to us and incurred our wrath”. Before entering the submarine I took a hard hat from the rack at the entrance, a wise decision because within moments I had hit my head. The vessel had a definite World War II air about it, and it was hard to believe that it had been in service as recently as 1996. The crew’s quarters were below and not accessible, but how 26 people could exist in there I could not imagine. The moral of all this is that if you want to join a navy don’t go for the North Korean one. By comparison the battleship was the height of luxury, although I don’t suppose the people who served on it thought so. Time to aim in the direction of Seoul, which I wanted to reach in the afternoon of the next day. 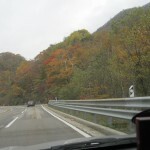 Taking the coast road northwards I turned off on to route 6, through the Odaesan National Park, another region of beautiful tree-covered mountains, highest of which is 1563m (approx. 5000ft.). More tunnels and then a minor road to a run down small town called Anheung, where I braved a scruffy restaurant (there weren’t any smart ones) for lunch. It was as cheap as it looked, but I did not suffer any after effects. On to Wonju and then the Expressway to Yongin, my night stop. 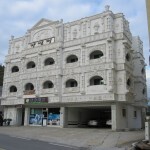 The Yongin Motel, shown on the satnav, proved to be inaccessible, but then I saw Motel Cinema, which looked quite decent. There was no sign of a cinema, but maybe the motel was built on the site of one. Apart from the name of the hotel absolutely everything I could see in Yongin was in Korean and I seemed to be the only westerner in town. At the reception I picked up a free map which had no English on it, and it took me some time to work out which way up to hold it. I went into a burger bar for a snack, and as I was sorting out my money the young lady behind the counter reached forward, touched the hairs on the back of my hand and giggled. I said “Do you think that’s funny?”, and she just giggled again. Oriental men do not have hairy hands, so I suppose if I am hard up I can always go to Yongin and earn a living in a circus freak show. 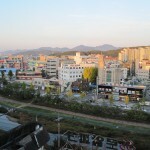 The reason for staying in Yongin was that I wanted to visit the Samsung Transportation Museum the next day. Samsung is a vast corporation and the Samsung Foundation has invested money in cultural ventures including the acclaimed Leeum Samsung Art Museum in Seoul. The Transportation Museum is in a spectacular modern building adjacent to a vast theme park called Everland, also connected with Samsung, and when I arrived the place was full of school children, quite literally hundreds of them. Nevertheless I managed to have a good look round and would rate the museum as no more than average for the quality of its exhibits. 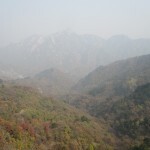 Because I was going on an organised tour the following day I had booked two nights at the Namsan Hill Hotel in the middle of Seoul, and it proved to be very difficult to find, defeating my satnav. In the end a kind man in a car led me there using his satnav, and even he found it difficult. 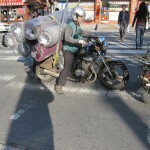 It was not too far from Chungmuro with the motorcycle shops, which I wanted to see during working hours. The streets behind the main road were a hive of activity, mainly motorcycle workshops or printers, all with their wares spilling out into the road. Piles of paper were stacked up everywhere (presumably the weather forecast was good) and the printers were standing by their machines waiting for orders. The businesses were serviced by a constant stream of vehicles, mostly motorcycle-based three-wheeled pick-ups, things like tuk-tuks, or tiny vans. 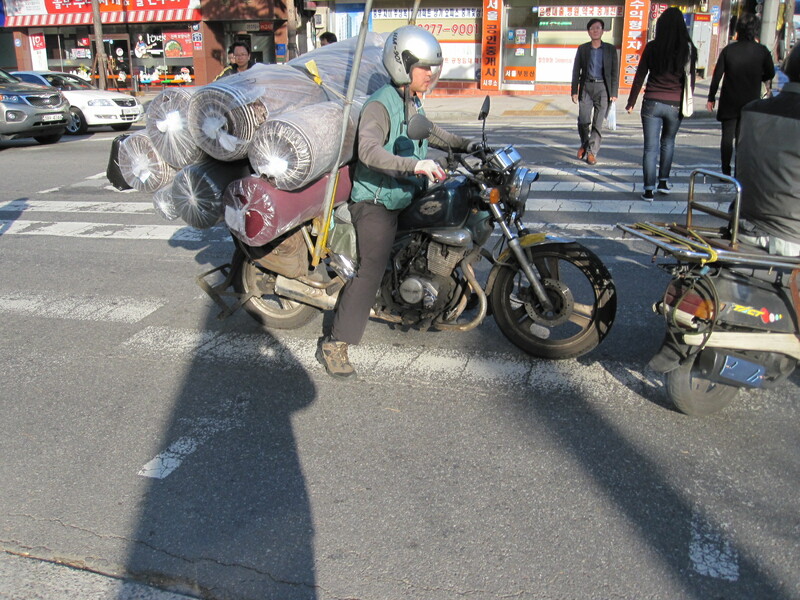 There were many small motorcycles with big steel frames on the back, loaded with goods towering above the rider. For a long period up to the end of World War II Korea was occupied by the Japanese. In 1945 the victorious powers agreed to divide the country into Russian-occupied Communist North and American-occupied capitalist South. The division was around the 38th parallel, with Pyongyang as capital of the North and Seoul capital of the South. In 1950 war broke out between the two sides (each blaming the other for starting it) with support eventually coming from many other nations on both sides of the political divide. In 1953 an armistice was signed by various parties including the UN, but not South Korea, so technically the two Koreas are still at war today. At the end of it all the whole country lay in ruins, but South Korea has recovered to become one of the world’s ten strongest economies. North Korea, meanwhile, is one of the world’s most unstable states, and certainly the most unstable to have nuclear capability, with warheads permanently lined up in the direction of Seoul. 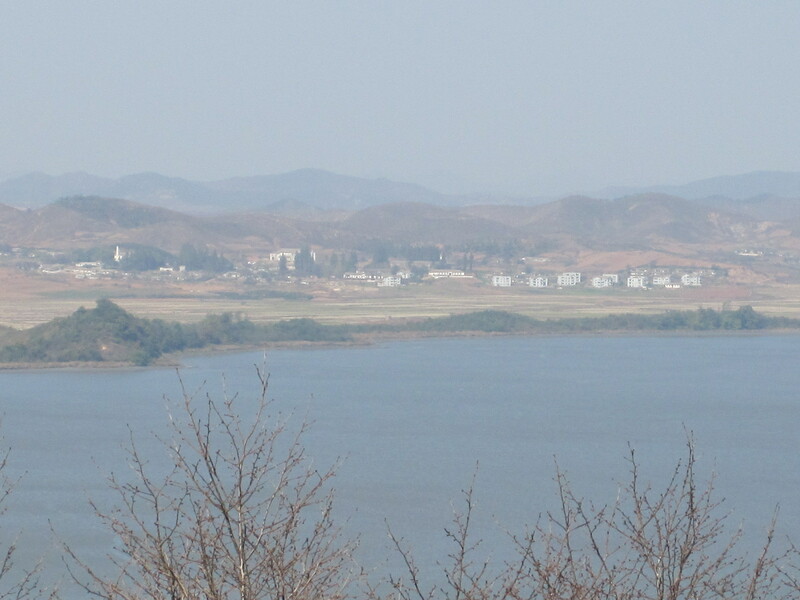 The border between the two countries is a 4km wide de-militarized zone (DMZ) still under UN control, and in the middle of it is the Joint Security Area (JSA) in which meetings between representatives of the North and South are periodically held. Citizens of certain countries, including the USA and most of Europe are permitted to visit the JSA on organised tours under strict UN supervision. 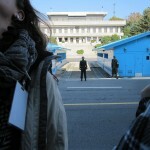 Before leaving home I booked via the internet a tour with a company called DMZ Tours for the day before I left Korea. The instructions mentioned a dress code to avoid offending the North Koreans, basically ‘smart casual’ – jeans ok but no sleeveless shirts, shorts, flip-flops or other scanty attire. At 9.00am I was picked up from my hotel by a young man of about 20 named Choi, who took me on a hair-raising drive through the alleys and streets of Seoul to the Lotte Hotel, which was their headquarters. At least it made up for not going on the roller-coasters at Everland. 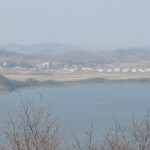 The coach took about an hour from Seoul to the Camp Bonifas American army base at the entrance to the DMZ. Most of the passengers were European or American, and our guide was a lady of Korean origin with American citizenship, as South Koreans are not allowed in the JSA. She spoke English extremely fast and was sometimes difficult to understand as she outlined what we should and should not do in the JSA. Several times she told us that we would be well looked after “If something goes wrong”, but did not specify what that might be. I pointed out that all the soldiers around the bus were wearing hard hats and asked why we were not being given them. She laughed and said “The soldiers will take care of you if anything goes wrong”. Also mentioned was that we might not be allowed into the JSA because six South Koreans who had been taken prisoner in the north were being handed over during the day. On entering the DMZ our passports were checked by a Korean soldier who stayed on the coach, and we were driven to a building and shown a film of the appalling life that people lead in North Korea. A lady defector from the North, a former naval officer, then answered questions about the conditions there. Back on the bus, depressed and full of hatred for the enemy, we were taken to a view point where we could see some distance into enemy territory, including a mock housing estate that was built to create the impression that everything was going well on the other side of the border. 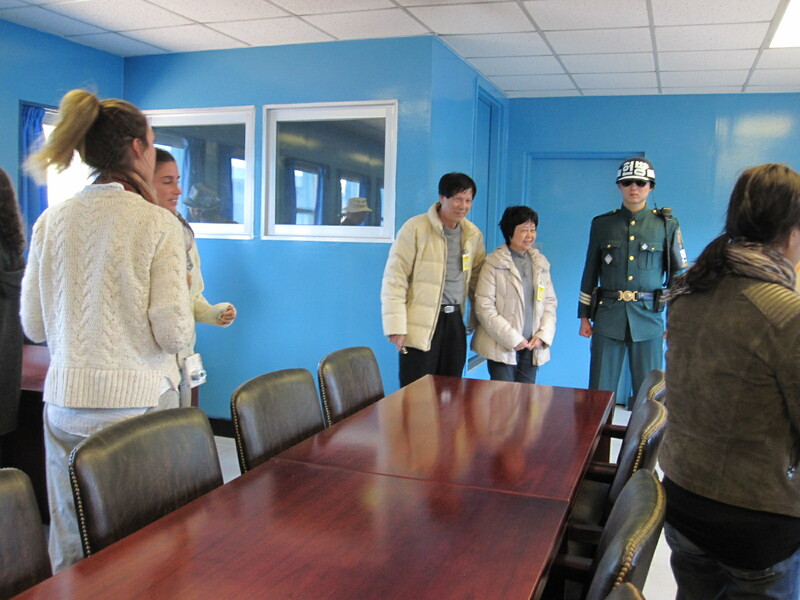 “The visit to the Joint Security Area at Panmunjom will entail entrance into a hostile area and the possibility of injury or death as a direct result of enemy action”. Another paragraph read “Visitors will not point, make gestures, or expressions like scoffing, abnormal action which could be used by the North Korean side as propaganda material against the United Nations Command”. We were now at the bit most of us had come for, and to my relief we were allowed in and taken to a room where the joint North/South meetings are held. In the room was a table with the exact border between North and South running through the centre of it, so that the parties involved are on their own territories. 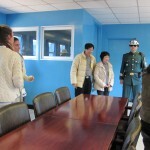 Two South Korean/UN soldiers were in the room, but, to my disappointment, no North Koreans (sometimes there are). However, the really important thing was that we were allowed to walk round the table into North Korea, thereby acquiring what the Rough Guide described as “some serious travel kudos”. Surprisingly, photographs were permitted at this point. 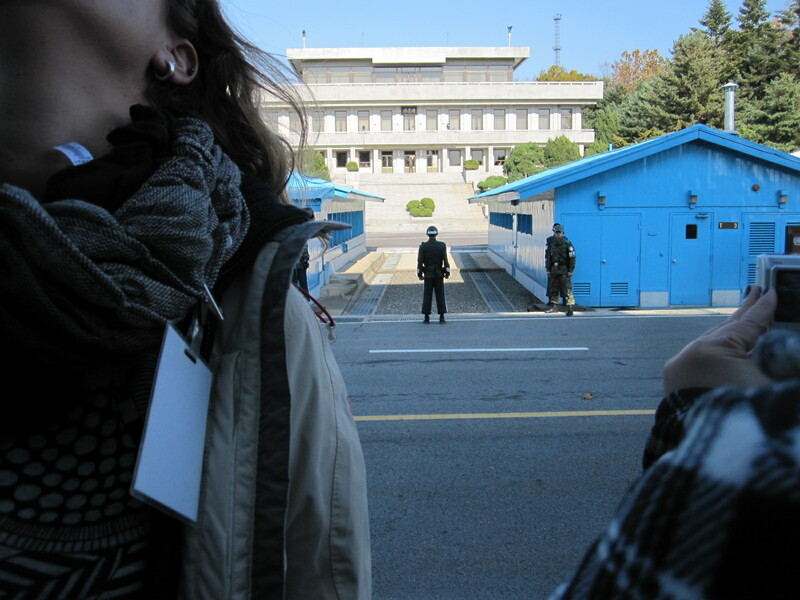 We were then ordered to stand neatly in two lines outside the building, facing the North Korean headquarters about 200 yards away. More photographs, and the lone enemy soldier on the steps of the building opposite raised his binoculars and looked at us. Back to the bus and back to earth, in the form of the gift shop, with everything from postcards to T-shirts to chocolates. As we drove away from Camp Bonifas we could see on the north side of the border the world’s largest flag on the world’s tallest flag pole, a product of an ongoing one-upmanship contest between the two sides. Our guide said the flag weighs 600lb and is too heavy to blow in the wind. She also said we were on The Most Dangerous Road in the World, although I doubted whether it was more dangerous than the streets of Seoul with Choi driving on them. 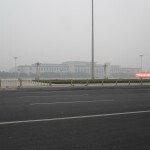 The next morning I had to take the car back and get my flight to Beijing. Despite the problems I had had with the satnav I decided to entrust it with task of guiding me to the airport from the centre of the third largest city in the world, a distance of about 30 miles. It seemed all right to start with, but after about an hour of wide streets, narrow streets, underpasses and U-turns I realised that I just wasn’t getting there, and simply turned north on a busy main street on the assumption that it would take me to the east-west expressway. Eventually it did, and after a while I came to the inevitable toll-booth. Just as I pulled up to the window to pay there was a jolt and loud crash from behind. For a moment I couldn’t believe it, and I don’t think the driver of the other car could either. We both got out and looked at one another and the cars. As far as I could see my car was not damaged, but there was some damage to his, another Hyundai. He indicated that we should go across to a parking area on the right hand side, which meant crossing about five lanes of traffic, but somehow we did it. He had very little English, but I got the feeling that he was a nice bloke and seemed to be admitting that it was his fault. He gave me his business card which said in English on one side that he was a research engineer with a big company. My phone would not work, but I asked him to ring the car rental company, which he did, and handed me the phone so that I could speak to them. I told them I would bring the car in but might be late. The other man also spoke to them. When I got to the airport the man from Avis looked at the car, took the other man’s business card and said it was ok. The amazing thing was that when I got home a few days later there was an email from the other driver saying how sorry he was. It was the first accident he had ever had, and he was concerned about whether I had suffered any injury. He told me not to worry about the damage to my car because it was covered by his insurance. A refreshing change from the dog-eat-dog attitude that has become the norm in England. As mentioned previously, I was planning to stay in Beijing on the recently introduced 72-hour visa free basis, but I was not sure about the actual procedure. My flight times would give me 71 hours there, and in the event it was very easy. Immigration was quick and my passport was stamped in English and Chinese with the permitted period of stay written in. 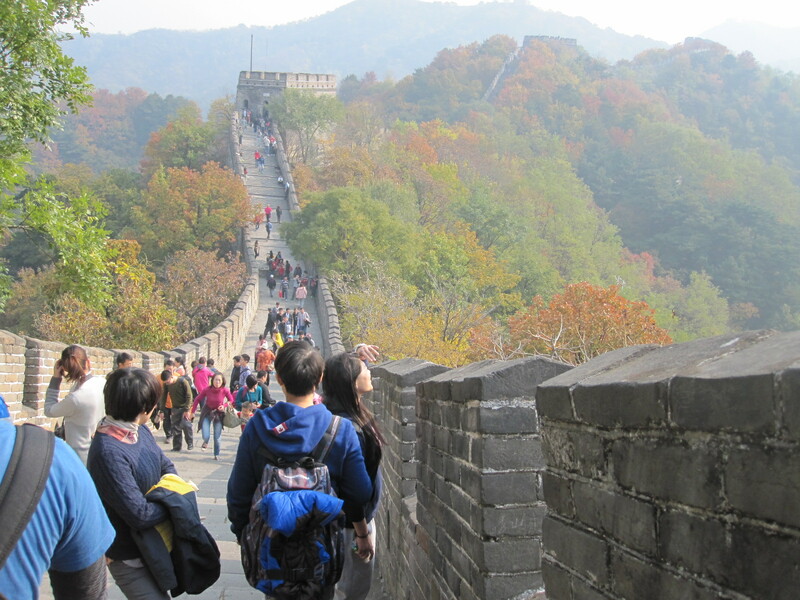 Travel was allowed not just within the city of Beijing, but the whole province, which includes several sections of the Great Wall. Although I spent a considerable amount of time studying the area before the trip I still had very little idea what it would be like. Most of the planning was done with the Lonely Planet guide and associated map. 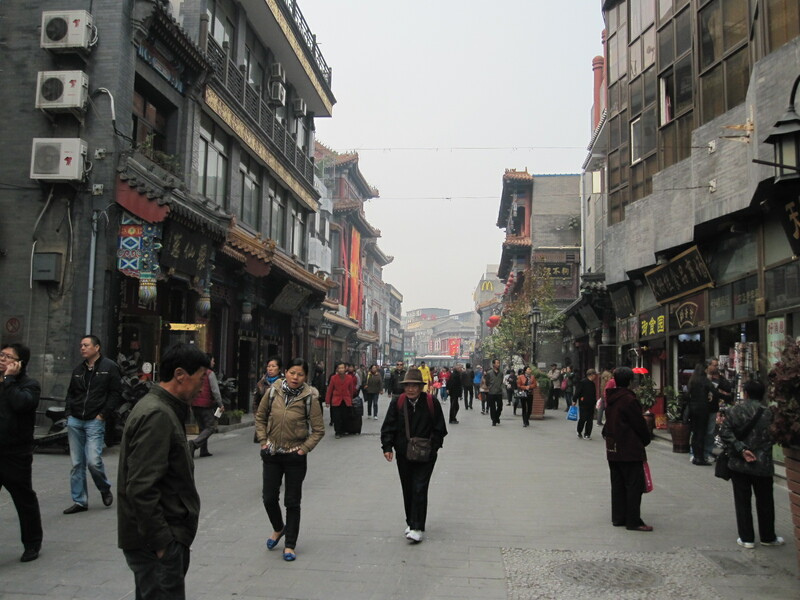 It was difficult to decide which part of the city to stay in, but I eventually settled on Nanluoguxiang, one of the remaining hutongs or old alleys that has been preserved and made into a popular tourist area. 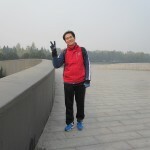 On Booking.com I found a Super 8 hotel in Nanluoguxiang at £27 per night, which seemed improbably cheap. Super 8 is at the bottom of the Wyndham Hotels range and the second cheapest motel chain in the USA, but I have stayed in them many times there. Super 8 is actually a franchise and it seemed that this hotel had only just joined the brand. There were no reviews and apparently it did not take western credit cards, but I was so intrigued that I decided to go for it and booked three nights in advance. The Airport Express and subway were also amazingly cheap and easy to use. At all points of entry to the subway system bags were X-rayed. One thing that I could not understand was that the stations seemed to be almost empty most of the time, yet the trains were absolutely packed. It was a considerable problem getting on with my wheelie case and fortunate that I only had to go for four stops with one change. The hotel was about 800 yards from Nanluoguxiang subway, and the lane itself was massively crowded at about 5pm on Saturday, making it very hard work to get through with my luggage. Ancient buildings on both sides had been converted into cafés, fast food outlets, gift shops, a self-service bank and backpacker accommodation. Chinese addresses are more logical than those in Korea, and the hotel was more or less where I expected it to be, though nowhere near where it was shown on the map on the Booking.com website or that of the hotel itself. On the internet I had read stories of taxi drivers who had been completely unable to find small hotels in Beijing, and before leaving home I spent a considerable amount of time with Google maps and other information to make sure where the hotel was located. When I entered the reception there were three people behind the counter, a lady and two men who looked like gangsters. None of them spoke any English at all, but we managed a small amount of communication via a laptop and Google Translate. They searched through my passport looking for a visa, and eventually found the stamp showing the dates I was permitted to stay in Beijing, and after a brief discussion decided that it was sufficient. The room was basic but quite large and clean. Good value for £27 per night, which I paid in cash because, as expected, they did not take western credit cards. By the time I went out for a look around and to get something to eat it was dark but the whole area was a hive of activity and I felt completely safe even in the narrow hutongs behind the main streets. 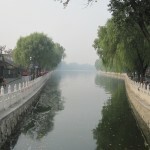 The plan was to spend my first complete day in Beijing on a trip to the Great Wall, and the second day on an electric scooter tour of the city in the morning followed by a further exploration on foot. 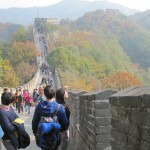 Several sections of the Great Wall are within one or two hours travelling time from Beijing, the most popular ones being at Bädálǐng and Mùtiányú. 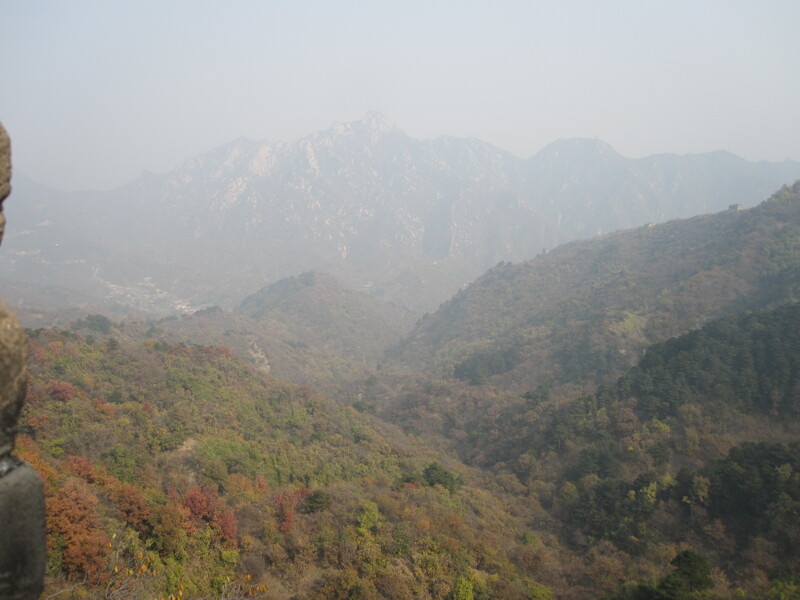 The latter is said to be better and less crowded than Badaling, and I had an ulterior motive in Mutianyu, because en route I was hoping to visit a classic car museum at a town called Huairou. The most usual way of getting to Mutianyu is by taking a bus from Dongzhimen Transport Hub in Beijing to Huairou and then a minibus to the Great Wall, but I was aware from various reports that any attempt to reach the wall by public transport was fraught with problems from hustlers and con men who try to relieve tourists of large sums of money on the way. Dongzhimen Subway station was four stops from Nanluoguxiang, and the Transport Hub was nearby. The 916 fast bus was easy to find, with a small queue which I joined. As soon as I got on the bus I discovered that it was necessary to have exact money to put into a machine for the fare, which I did not have, so I had to fight my way off to sort out some change. A man with a blue jacket who appeared to be from the bus company shouted at me. While I was sorting through my bag for the money two girls came up to me saying that they were from Taiwan and asked if I would share a minibus with them at Huairou. I said I would because I knew it would be a problem on my own. Before I could find the money the man with the blue jacket grabbed me by the arm, bundled me back onto the bus, and sorted out change for the fare once I was sitting down. It then became apparent that the two girls were actually part of a group of five girls and two boys who worked for a sports marketing company in Taiwan, on a sort of company weekend away. They said the man with blue jacket was a minibus driver who wanted to take them from Huairou to the Wall, but they did not know whether he could be trusted. My instinct was definitely that he couldn’t, but as they could speak the language I just decided to see what would happen when we got to Huairou. 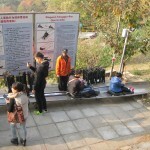 According to what I had read there were several bus stops in Huairou where minibuses were waiting to take people to the Wall, and sure enough at one such place Blue Jacket indicated that we should get off, which we did. My Taiwanese friends argued with him for a while and then said they had agreed a price, including me, which seemed ok. Blue Jacket tried to separate me from them but I insisted that I was with them. 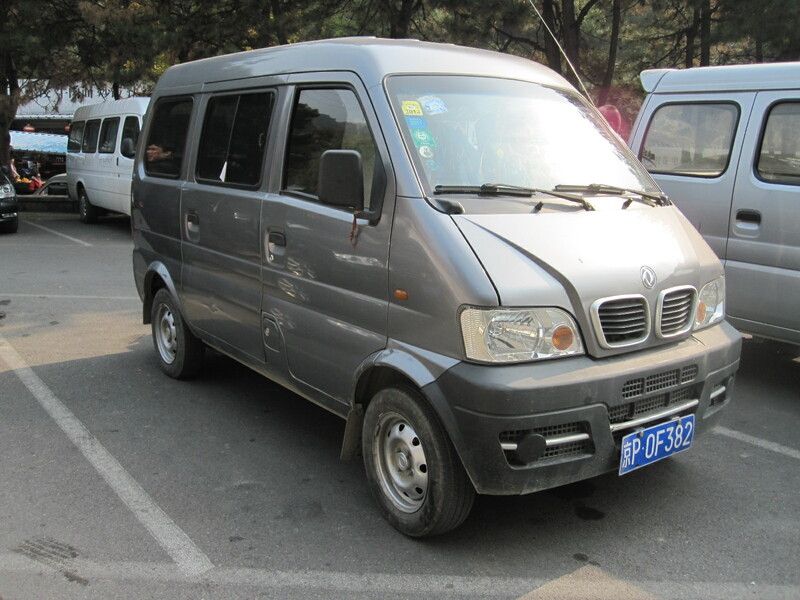 The minibus turned out to absolutely tiny, based on a little Chinese van like a Suzuki Carry or Bedford Rascal. I sat in the front next to Blue Jacket and the other seven were all crammed into the back, which they seemed to enjoy. The poor little van, with an engine of 1.0 or 1.2 litres, really struggled but eventually we reached Mitianyu. Blue Jacket forced his way ruthlessly through the traffic, shouting all the time at everyone and everything until we reached the access point for the Wall, which was high on the hill above. You can either walk up a long steep path to the Wall, or go up on a chair lift. My friends decided that we would go on the chair lift and a couple of them went off to get tickets. Blue Jacket was clearly not pleased about that, because they were cutting out the middle man, and he made another attempt to get me on my own but failed to do so, as I made it clear that I was staying with the others. It was difficult to understand what was going on, but I gathered that we were supposed to be at the bottom of the chair lift by 4.00pm for Blue Jacket to take us back to Mitianyu. The chair lift was as scary as chair lifts always are. I sat with Ariel, the leader of the Taiwan group, and talked intensively to avoid showing how terrified I was. At the top the view from the Wall was superb, but somewhat limited by the grey haze that is said to be caused by pollution from Beijing, about 30 miles away. The Wall stretched away into the distance, following the contours of the hills to a point several hundred feet higher than our position. It was an awe-inspiring sight and I found it impossible to imagine how such a substantial structure could be built over a distance of more than 500 miles. Started in around 200BC it was built, rebuilt and reinforced over two millennia with two or three million people working on it. 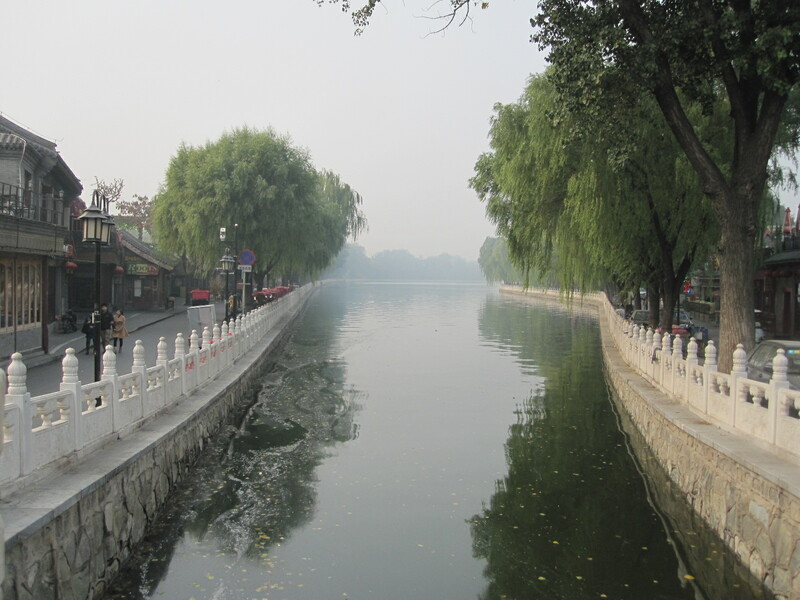 Most of the existing sections were built during the Ming dynasty (1368 – 1644) and those in the Beijing area, including this one, were restored quite recently. It was not clear how far the others intended to walk, but I knew I couldn’t walk as far as we could see. The path was mostly quite wide, 15 to 20 feet, with walls either side and battlements, but it was not easy walking, with uneven stone setts and long flights of steps up and down most of the way. The steps were of irregular height and tread width, becoming steeper and narrower every few hundred yards near the watch towers. It was agreed that if I could not keep up the others would go on and I would just wait for them to come back. In the event they stopped every couple of minutes to take photographs, mostly of each other, and we did not really walk very far before sitting down to eat the food that we had bought from stalls near the chair lift. I took some photos of the group and of the iconic views through the battlements or lookouts in the watchtowers, which were like the classical pictures of Chinese landscapes with foliage in the foreground. The weather was perfect. I suppose we walked about two-thirds of the way to the highest point that we had been able to see from the chairlift, and that was much more than I had expected to be able to do. On the way back some of my friends had to stop for a rest and asked me if I had been in the military! When we got to the top station of the chair lift I realised that there was an alternative way down in the form of one-person sledges on a stainless steel slide like a bob-sleigh run, and then found that we had tickets for it. 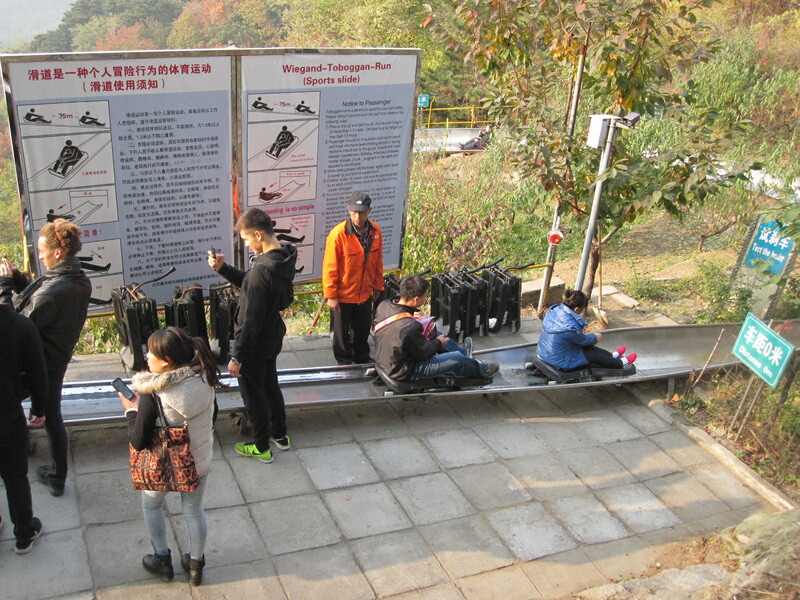 As we waited in the queue we could see that the black plastic sledges had a lever at the front that was pushed forward to go faster and pulled back to brake. As my turn approached I noticed that a lady two places in front of me was all ready to go when the man in charge said something to her and after a few words she got off the sledge looking absolutely furious. A voice behind me said “If they ask your age don’t tell them you are over 70, because no one over 70 is allowed to use the slide.” They didn’t ask my age (I don’t think they could speak English) but I have to say that it was a very long way down and by the time we got to the bottom the muscles in my lower back were at breaking point. 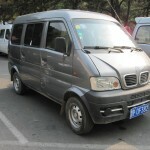 At the time and place agreed with Blue Jacket a Transit minibus came along driven by a much pleasanter young man and took us all the way to Beijing rather than just Mitianyu, so the transport was actually quite a good deal in the end. To avoid the traffic on the motorway he took us on country roads most of the way and it was interesting to see that the built-up area of Beijing was smaller than I would have expected, much smaller than Seoul. In the suburbs were vast blocks of flats similar to those in Russia and Eastern Europe. It had been a good day, although the car museum will have to wait for a future visit if I live long enough. In the course of my research into the trip I discovered on the internet a company running half or whole day electric scooter tours of the city. The business was run by a Canadian named Nathan Siy and I booked a half day tour for the morning of my second full day in the city. The appointed meeting place was at Exit A of Ciqikou subway station and I got there a few minutes early. Some people were standing around but it was not possible to tell who was waiting for the tour and as I was the only westerner it was unrealistic to ask anybody. In due course a tall young Chinese chap turned up on an electric scooter, introduced himself as Herbert and said there would be just the two of us. So it was to be a personal guided tour. Herbert went off to get another scooter and came back with one that fell over as soon as he put it on its stand, something that, by the look of it, had happened a good few times before. It was time for the short training session, so Herbert showed me the operating instructions for the bike in English on his smart phone and sent me off to ride around the posts on the paved area adjacent to the station. Currently I have three motorcycles, ranging from a 6bhp monkey bike to a 98bhp Honda Hornet, so I was not expecting to have much difficulty with the electric scooter, although I don’t think I had ever ridden any sort of scooter before. The only slightly odd feature of it was that if the twist grip “throttle” was kept in one position for more than three seconds it would maintain that power level until either of the brakes was applied, a bit like a cruise control. Anyway, Herbert appeared to be satisfied with my riding ability, so we set off into the traffic. 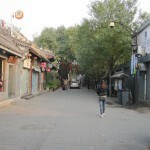 Most of the main streets in central Beijing are very wide with marked lanes at the side for bicycles and other low-powered vehicles. There is often a degree of physical separation in the form of lightweight marker posts. 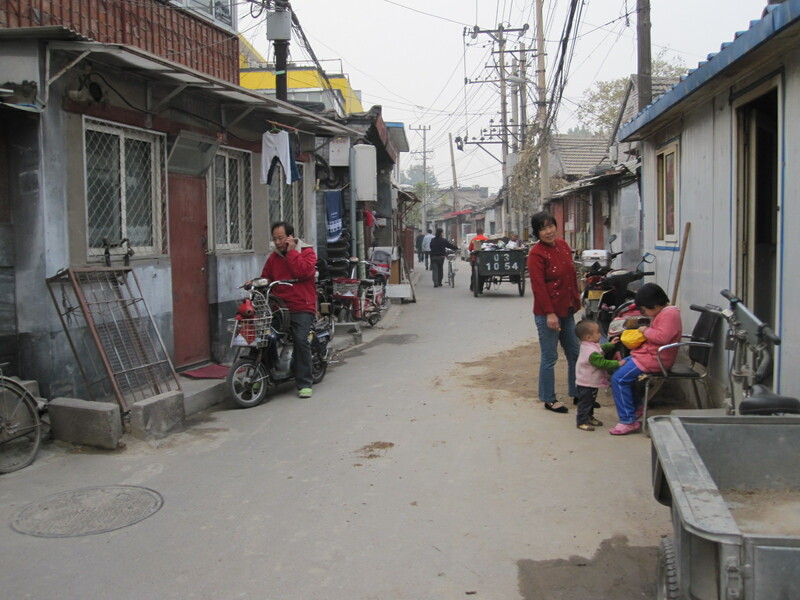 We started on one such road and shortly turned off into an area of hutongs in which people were living and working in the old buildings, as they always have done. It was all a bit of a mess, but that is what tourists want to see, rather than the sanitized new developments that the authorities seem to think they ought to see. The people living in such areas are undoubtedly poor compared with many of those working in the huge office blocks a stone’s throw away, but it was hard to tell whether there was real poverty. 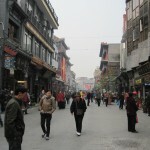 Eventually we emerged from the hutongs into a modern pedestrianized shopping area and rode for some distance across the paving. As Herbert parked the bikes he chatted to two policemen, so I assumed that we were not guilty of any traffic violations. 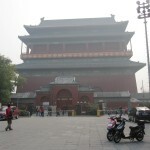 We walked through to Qianmen Dajie, a wide pedestrianized street lined with modern buildings in the style of old Peking. I asked Herbert whether he preferred them to the original ones, and he said he did. From here we worked our way northwards, stopping frequently for Herbert to explain the sights as we came to them. 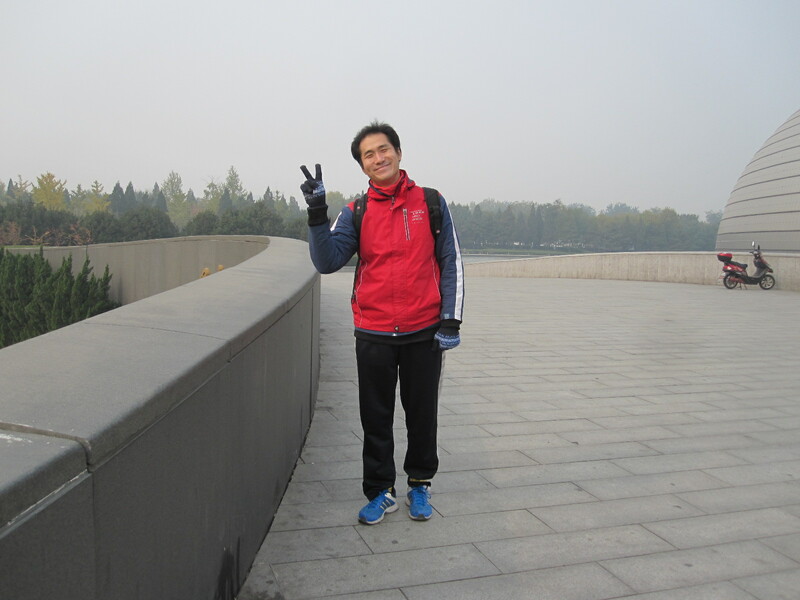 His English was quite good and he was certainly passionate about Beijing, which he referred to proudly as “my city“. His knowledge of the history of the area seemed to be excellent and he was always able to answer my questions. After each stop he would shout “Let’s go”, jump on his scooter and press on quite hard to the next attraction. A lot of concentration was needed at times when we crossed big junctions with heavy traffic in all directions, but I did not find it really difficult. 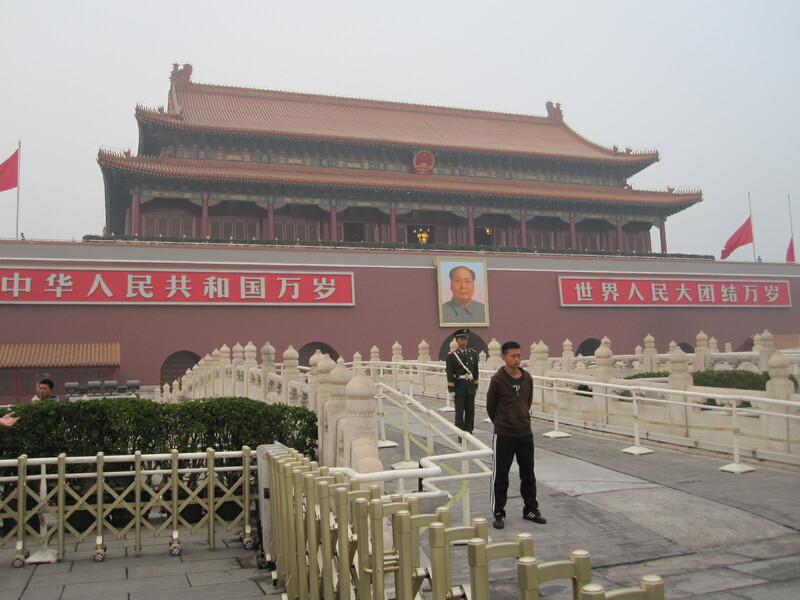 We stopped to look at the entrance to the Forbidden City, but could not go in because it was closed on Mondays. Next on the agenda were the beautiful Houhai Lakes, followed by the ancient Bell and Drum Towers which were used to mark the time of day. 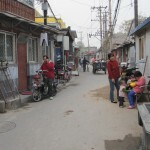 It was then a fast ride back to Ciqikou via Tiananmen Square, taking in some more hutongs, which I really enjoyed. 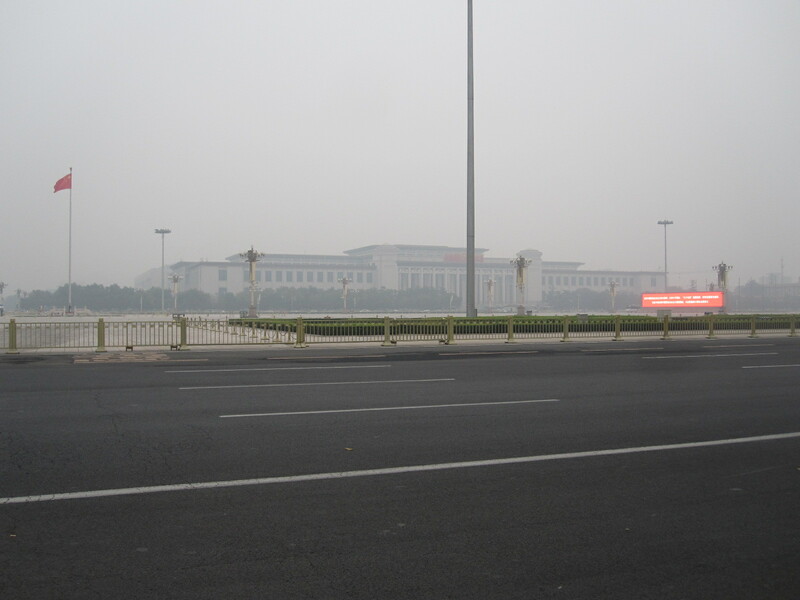 We rode along one side of Tiananmen Square (said to be the world’s largest public square) but were not allowed to stop and eventually arrived at Ciqikou at 2.00pm, 4½ hours after we left. To my mind this was a good way to see the city in a short time, although it would not be suitable for anyone who was not used to riding bicycles or motorcycles in heavy traffic. After saying goodbye to Herbert and getting something to eat I set off on foot to Tiananmen Square via some of the hutongs that we had ridden through. 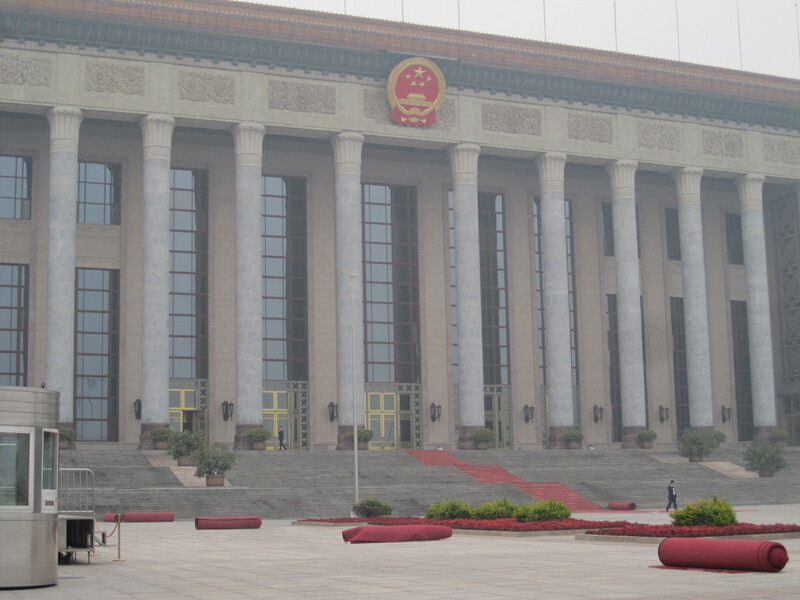 On one side of the square is the Great Hall of the People, where a conference of some sort had just finished and the red carpets were being rolled up and taken away. 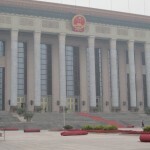 In the square itself is the Chairman Mao Memorial Hall which had enormous illuminated signs placed right across the front of it, presumable intended to inspire the populace in some way. For some time I had been looking for a new backpack, and I noticed that Herbert had a very smart one with Swiss army style badges on it. Just off Tiananmen Square was a shop selling luggage, so I wandered in for a look round, and sure enough there was a backpack just like Herbert’s. When I examined it the shopkeeper quoted a price which I thought was too high, but as soon as I turned away the price started to tumble and came down to the equivalent of about £20, which is probably less than half of what it would have been in England. It appeared to be a genuine Wenger one, which would no doubt be made in China anyway, so I bought it. We put my existing backpack inside it, complete with contents, and I continued on my way. This is to be the first stage of my new Young Tour Guide image, even though I am not a tour guide. 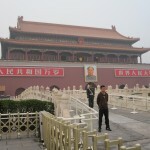 On the north side of Tiananmen Square is the Gate of Heavenly Peace with a huge portrait of Mao. It was amusing to see that each of the three immaculate soldiers guarding the area in front of the building had a casually-dressed kick-boxer type in front of him, to keep the crowd at bay. An area of paving was taped off in a rather odd way with a lot of people looking at it, and it was only two days later, when I was back at home, that I read about an incident that happened very close to the time when Herbert and I had ridden down the other side of the square. A car had been driven into the crowd and five people were killed, apparently as an act of terrorism. Unlike the reaction in England, where the area would have been closed off for weeks or months, the authorities had made a point of returning it to almost complete normality with two or three hours. 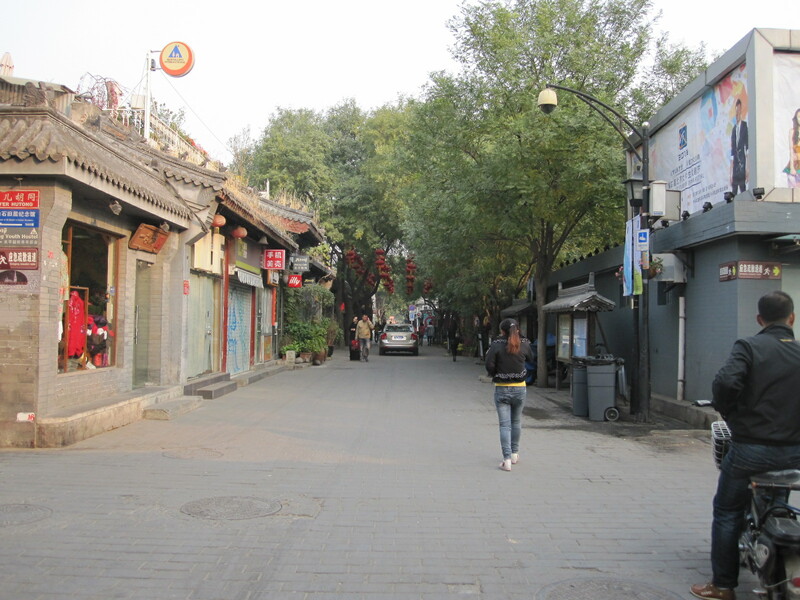 By the time I reached Nanluoguxiang it was dark and I had walked about five miles through the lanes, streets and squares of Beijing. The next morning it was back to the airport and back home, but I had enjoyed my stay in the city so much that I resolved to return for another look next year. In both countries, as in Japan, you are never far from a free public toilet. In the 800 yard length of Nanluoguxiang there were three, and even I managed to get through without stopping at all of them. One town that I did not get to in Korea was Suwon, where the mayor dedicated his life to improving the public facilities and finished up living in a house shaped like a lavatory and turned the whole place into a toilet-based theme park. In Korea I did not see a single book shop or magazine kiosk apart from two small ones at Seoul airport, and I came to the conclusion that the people don’t read anything unless it is on a screen. Beijing was different, with lots of magazines and some book shops around. Before going I had been told that both destinations were expensive, but I did not find that to be the case. If you stay in the best hotels and eat in the best restaurants it will be expensive anywhere, but overall I thought prices in Korea were about 25% lower than at home. Beijing is more expensive than Korea, but some things, like public transport, are ridiculously cheap, as was the Super 8 hotel. 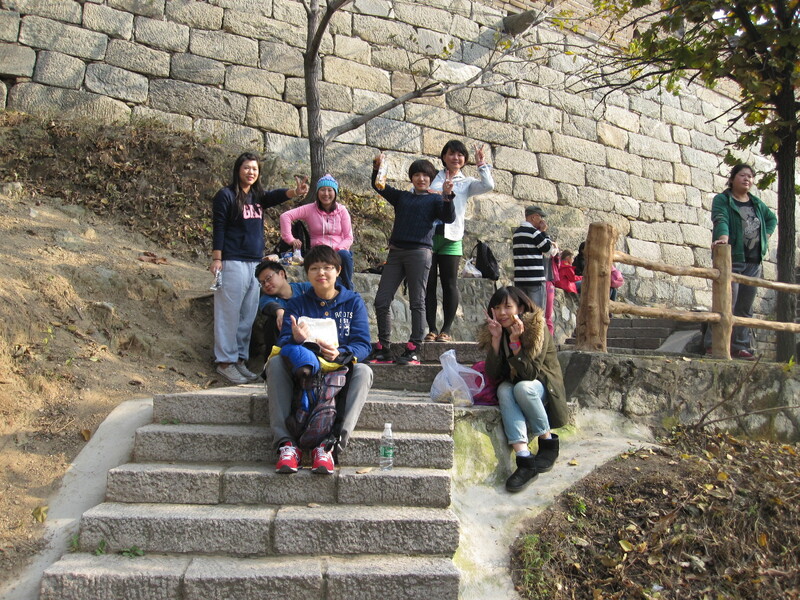 People were generally friendly and helpful, and although some people had said Koreans were hard-natured I did not think so. They are very westernized and perhaps less entrenched in their culture than people in some other countries. The only person on the whole trip that I did not like was Blue Jacket, and I think the feeling there was mutual. 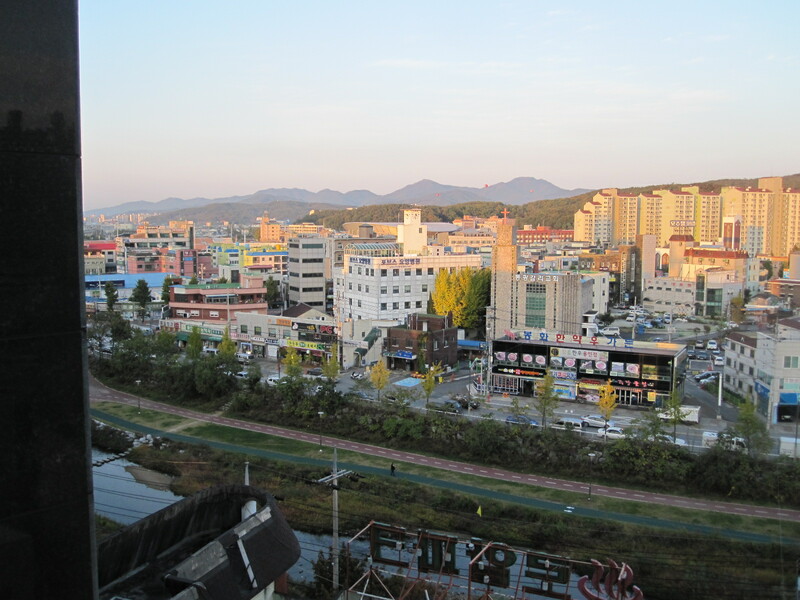 Not being able to speak or understand the language does not bother me at all, and I always muddle through somehow, but in places like Chuncheon, Yongin and Anheung very few people spoke English and the ones who thought they did were often hard to understand. Sometimes I got the impression that people were desperately keen to help when they found themselves faced with a foreigner and felt embarrassed that they were unable to do so.